This is a variation on the Balsamic Vinegar and Sesame Chicken  recipe. I came up with this when I ran out of balsamic vinegar and had to make do with plain red wine vinegar - which of course is much cheaper. It’s even simpler to make since you do not have to deal with the sesame. I’ve even left the skin on this time for extra flavor, but you can remove it if you prefer too. Cut the chicken into bitesize pieces. Season with salt and pepper, then coat lightly with cornstarch. Heat up a frying pan with the oil. 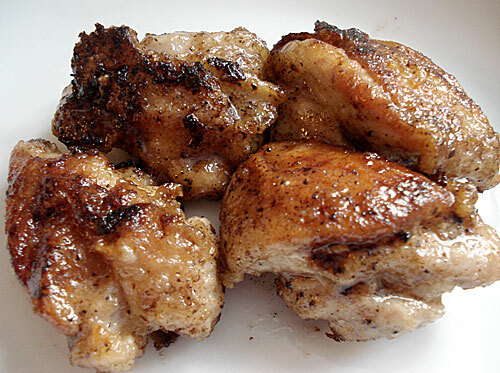 Put the chicken skin side down in the pan, and cook until they are golden brown. Turn over and cook on the other side. When the chicken is done, drain off any excess poil, and sprinkle on the sugar and the spice. Pour in the vinegar and stir the chicken pieces around as the liquid rapidly evaporates. It will form a slightly sticky sauce in a couple of minutes. As soon as the liquid is almost gone, take off the heat. (You can add a few drops of soy sauce at this point for even more flavor, though then you’ll want to cut down on the salt you season the chicken with before.) Eat hot or cold. Cut into 12 pieces, each piece is around 50 calories. I usually use around 2 to 4 pieces in a bento box (though the Hungry Guy will eat it all in one go given the chance).